Review: "Mastercastle: On Fire" - Sea of Tranquility - The Web Destination for Progressive Music! 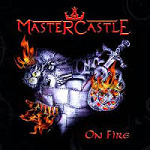 Melodic female fronted metal group Mastercastle's latest album On Fire is their first musical outing with drummer John Macaluso (Ark, Yngwie Malmsteen). John's notable drumming has made for a great addition to those recordings that he has previously performed on. With the contributions of Mastercastle's well skilled new drummer along with the alluring vocals of Giorgia Gueglio, guitarist Pier Gonella and bass player Steve Vawamas they have ensured that the final result is the creation of a gripping contemporary sounding new Mastercastle release. The guitar work of Pier Gonella is very impressive and the spotlight is shone on him with the inclusion of two favourable instrumentals with "Almost a Fantasy" and the colourful vibrancy of "The Final Battle" as he is given more freedom to show what a tasteful and diverse musician he is. Pier is a founding member of Mastercastle and has performed with other metal acts including the excellent Italian power metal group Labyrinth. Being quite the versatile player Pier is also the guitarist for the extreme metal band Necrodeath. "Silver Eyes" shows Mastercastle is off to a flyer, while "Chains" grooves along at mid rocking pace as do "Leaden Roads and "Titanium Wings". On Fire is a fitting album title especially in relation to the brisk track "Quicksilver" which promptly surges along propelled by Macaluso's kick pedals and the bass of Vawamas while guitarist Pier gets his neo-classical hat on. "Gold Violet" is much slower and quite tranquil in comparison at times including a most suited guitar solo. The quality of the material presented on On Fire should ensure that this album will receive the same kind of favourable reviews which Mastercastle's previous releases have been awarded.